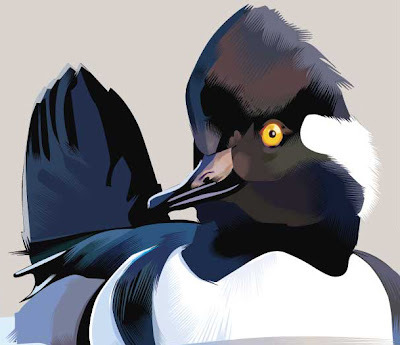 Hooded Merganser on the drawing board. Am liking whats going on here as I have been away from the land of the dancing vectors. I hope to keep this looser than I have gone recently--it feels fresher and more serigraphic if I do. Not done yet, but in progress. Wanted to share it with you. Felt like sleeping in the freezer last night. Fab!